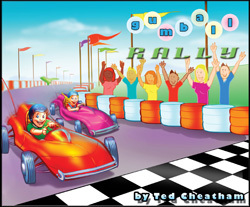 It's a long distance go-kart race forthe coveted Gumball Cup! Players use numbers and colors to better posiiton themselves in the race: higher numbers pass lower numbers and a color passes the same color if that kart is ahead of them. Play through two checkpoints then the finish line! A very fast, fun game for the whole family - up to 8 players!